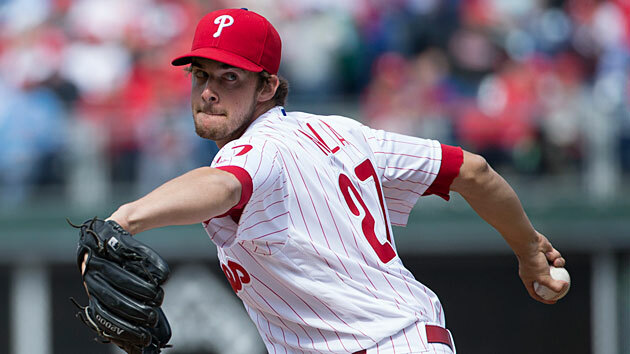 His personality may remain a mystery, but it's no secret that Aaron Nola has become the ace of the rebuilding Phillies. Perhaps the only person who is not impressed with Aaron Nola is Aaron Nola. Nola’s non-plussed attitude is nothing new. Even those closest to him struggle to recall unusual qualities or interesting anecdotes when asked about him. “He’s kind of boring,” says Stacie. “The most emotion I’ve ever seen from him was a fist pump,” admits A.J. “This is a hard assignment!” says his older brother, Austin. “You ain’t gonna find nothing on him,” says Philadelphia catcher Cameron Rupp. Aaron laughs. “I’m just low-key,” he explains. He’s always been that way. His family theorizes that growing up in Baton Rouge as little brother to type-A Austin, now 26 and the Marlins’ Triple A shortstop, taught him to leave the stress to his sibling. Austin spends hours before games planning his approach at the plate and getting himself mentally prepared. Aaron takes a nap. When Brady Domangue, who would become Nola’s best friend, got to LSU before the 2014 season, he was taken aback. And it’s what may make Nola, who turned 23 last Friday, the perfect candidate to lead Philadelphia’s rebuilding effort. Nola has had little reason to be uptight since that debut last July. He went 6-2 with a 3.59 ERA in his rookie season and is 5-4 with a 2.65 ERA this year, while ranking among the top 10 in the National League in K/BB ratio (5.667, third), Fielding Independent Pitching (2.73, sixth), WHIP (0.987, seventh) and strikeouts (85, eighth). Although Nola insists Philadelphia will be in the playoff hunt, the team has lost 13 of its last 17 and is now four games below .500 after a 24-17 start. With a major league roster consisting mostly of aging former stars, kids still getting used to charter flights and backup-types in starting roles, the Phillies are a year away at best. Third baseman Maikel Franco, 23, centerfielder Odubel Herrera, 24, and righthander Vince Velasquez, 23, are already producing at the major league level, and to be sure, more help is not far off: The team’s rebuilding effort has produced one of the best farm systems in baseball, with seven of MLB.com’s top 100 prospects, including stud 21-year-old shortstop J.P. Crawford, who will likely be in the majors at some point this year. The organization already likes what it sees from Nola, who is already the club’s ace and has the mind-set to match. McClure and manager Pete Mackanin both speak fondly of an episode last September, when the Phillies faced the Nationals. With the bases loaded and the score tied 2-2 in the top of the fifth, Nola tried to sneak an inside fastball by Jayson Werth, a pitch that had resulted in outs twice before that same day. Werth deposited it in the leftfield stands. Afterward, catcher Carlos Ruiz explained to Nola that major league hitters will often guess right, and that pitchers need to learn what the hitter is looking for. "I can’t wait to be in that situation again," Nola said. It came two weeks later. This time Nola struck out Werth on three pitches, all down and away. Almost the only way to get Nola riled up is to tell him he’s bad at something athletic. Most of the time his friends start in on him about Ping-Pong or hunting or fishing, because it’s hard to talk too much smack to a major leaguer, but they do their best. Austin got the baseball team at LSU, where they overlapped for one year, to use his childhood nickname for his little brother—Karen Michelle (a play on Aaron Michael)—and makes sure to loudly announce the results every time he beats his younger brother in anything. Nola's pitching repertoire is similarly tame. His fastball averages around 90 mph, so he relies on movement, pinpoint command, an excellent curveball and a changeup he spent the off-season working on. Ever since he got shelled as a college freshman trying to throw flat 95-mph four-seamers, he’s focused on pitching rather than throwing. Nola’s reaction is the same whether he struck the last batter out or gave up a home run. He restricts demonstrations of how fired up he is to the intensity with which he places his glove on the bench between innings. For now, the Phillies have to trust the process too. If Nola keeps pitching the way he has and the rest of the team falls into place around him as planned, things could get very interesting.